TYPE OF WINE: Top of the range red wine. AGEING: 20 months in French oak barrels. LOCATION: Adrada de Haza (Burgos). WINE PRODUCING REGION: Ribera del Duero Denomination of Origin. WINERY / PRODUCER: Adrada Ecológica S.L. ALCOHOLIC STRENGHT: 14 % vol. FREE SULPHUROUS ANHYDRIDE: 3 mg/l. COMBINED SULPHUROUS ANHYDRIDE: 8 mg/l. TOTAL SULPHUROUS ANHYDRIDE: 11 mg/l. TOTAL ACIDITY (TARTARIC): 4,72 g/l. VOLATILE ACIDITY (ACETIC): 0,71 g/l. SIGHT: Vellum wine opaque, violet and purple. Surface satin, velvety. Frankish, noble appearance with a brilliant, clear appearance. Gorgeous, dyed and abundant glycolic tears slip through the glass when shaken. NOSE: Wine with good aromatic intensity, typical of this variety. Powerful aromas of blackcurrants, toasted, nutmeg and cloves. MOUTH: Powerful, fleshy, vigorous, dense, consistent, balanced wine fills our mouth with its presence. Tannin soft, sweet, toasted fair. Its well assembled wood and glycerine give us the final point to a wine to taste in company. TYPE OF FERMENTATION: Spontaneous, without artificial yeast. ALCOHOLIC FERMENTATION: 15 days in stainless steel deposit at a temperature of 22º C.
MALOLACTIC FERMENTATION: 60 days in stainless steel deposit at a temperature of 18ºC. CORRECTIONS: We do not add any products to correct the wine. HOLDING: Sulphurous anhydride in minimal proportions (see chemical analysis table). LENGTH OF TIME IN BARREL: 20 months in French oak barrels. TYPE OF BARREL: French oak barrel with a capacity of 225 liters. AGE OF THE BARRELS: First, Second and Third year. DATE OF BOTTLED: September 2018. AGE OF THE VINEYARDS: 20 years. TRAINING OF VINES: Bush vines. SURFACE AREA OF VINEYARDS: 1 Hectare. 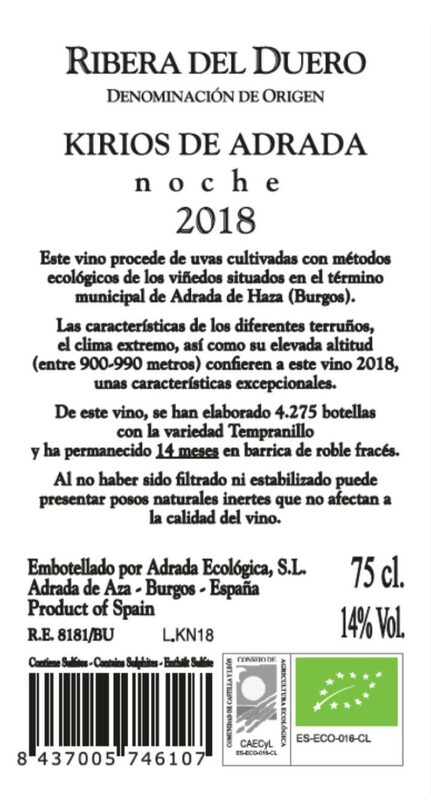 PRODUCTION YIELD, KILOS OF GRAPE PER HECTARE: 3.600 kg/Ha. SOIL: Deep limy and stony soils with a loamy-clayey texture. ALTITUDE: 900-920 meters above sea level. CLIMATE: Continental – Mediterranean, with very pronounced maximum and minimum temperatures and very marked differences between day and night temperatures. GRAPE HARVEST: Grape picking takes place in the month of October, into 15 kg cases, with a meticulous grape selection. BOTTLE: 75 cl Bordeaux Stylus; Height: 325 mm; Colour: moss. PRESENTATION BOX: Cardboard box of six bottle of 75cl.